The Zap Alias won the on-line poll for the most attractive car, but this car is far more than just a pretty face. 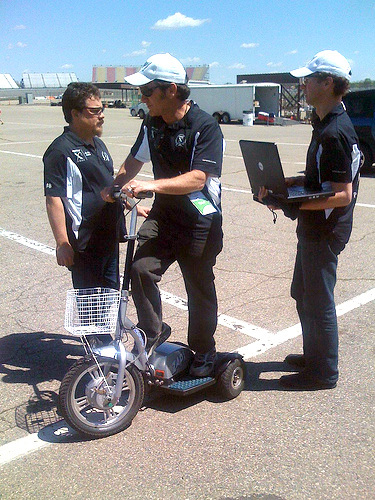 An efficient and quick three-wheeled side-by-side, this electric vehicle carries a 32 kWh advanced lithium-ion phosphate battery made by one of the largest BEV manufacturers in the US, yet it still weighed in at a modest 2733 pounds. This car showed innovation in both its design and execution, yielding excellent performance and efficiency. Thankz for the great video, XPRIZE! Watch more videos at the XPRIZE Foundation YouTube Channel. The ZAP Alias electric car sailed smoothly through the highway efficiency testing on June 24, 2010 in a heat that included Edison2, E-Tracer, West Philly Hybrid and Aptera. The Alias is being driven by two-time Indy 500 Al Unser Jr. That little truck towing the Alias out the starting line is our XL electric truck. Al Unser Jr. has lived a pedal-to-the-floor life, toddling around the pits as his famous father raced around the track, winning his sport’s biggest prize twice himself, becoming a teacher to the next generation of open-wheel stars. So when he was asked to gear back during the Automotive X-Prize, a competition that’s supposed to be more innovation than acceleration, well, you know what happened. “I just wanted to see what it could do,” Unser said. Curiosity is what got Unser behind the wheel in the first place, pairing a man used to high-decibel, low-miles-per-gallon speed machines with a Star-Wars-pod-looking prototype electric car not much louder than a dishwasher. Turned out to be a perfect match. It started two years ago, when a friend told Unser about the Zap Alias, a prototype electric car that could hit freeway speeds and had a range of 100 miles. The two-time Indianapolis 500 winner was intrigued by a drawing of the car and contacted Zap, forming a relationship between one of the fastest drivers in the world and a company at the forefront of alternative-fuel transportation. 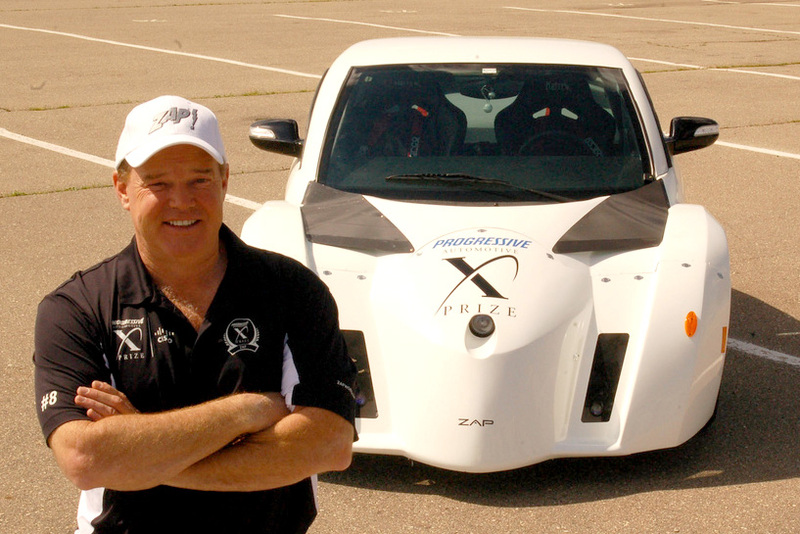 So when Zap needed someone to drive the Alias in the Automotive X-Prize, a $10 million competition to develop super fuel-efficient cars, Unser didn’t hesitate. “I told them I’d love to be a part of it,” he said. There is a certain irony to Unser’s pairing with an alternative-fuel vehicle. Al Unser Jr. does a warm-up in the parking lot of Michigan International Speedway at the PIAXP Shakedown. This is the first time he drives the ZAP Alias. ZAP's Alias Design Team Has Experience with Race Cars, Space Rockets and Roller Coasters. Spirits are high in Santa Rosa, California where the ZAP Alias team read the announcement that it has been cleared for the knockout stage in the Progressive Insurance Automotive X PRIZE (PIAXP) starting June 20th at Michigan International Speedway. Maybe that’s because this is more than just a competitive team in a 100+ MPGe vehicle contest, but the design and engineering department for a company on a 15-year mission to bring more electric transportation to the people. And much of the work on the X PRIZE entry of the ZAP Alias over the past three years has been something the ZAP Team has done between other projects that are just as important and competitive as the X PRIZE. Imagine working on building a 100 MPGe car, while also engineering a Postal Vehicle for the United States Postal Service, electric fleet trucks for the US Military and universities, vans for companies like Genetech, an electric SUV taxi for the China fleet market, an electric utility ATV, AND a variety of lithium battery packs for upgrading its line of electric vehicles. And, these are just the projects that aren’t top secret. This team has a diverse makeup of veteran automotive engineers, seasoned automotive technicians, youthful, enthusiastic talent, electric vehicle pioneers and master automotive craftsmen. Team leader Gary Starr has been working on electric vehicles for more than 35 years, having built his first electric car in college. 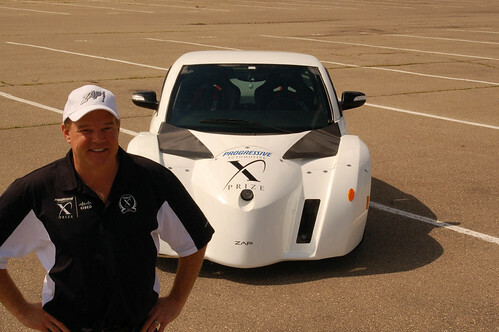 Together with Chuck Turney, a master automotive designer and builder with 35 years experience working for the Detroit Auto Industry, Starr and Turney have an ideal blend of leadership for a team building electric cars of the future. With several young engineers and technicians, the ZAP Team has proven to be a dynamic combination of talent and ingenuity. Some of the team graduated from universities in mechanical and electrical engineering and design, including Joseph Rajakaruna, Frederic Marangone, and Prashanth Radhakrishnan. The team also has loads of automotive experience. We mentioned Chuck Turney’s auto experience, with companies like GM, Magna and other automotive suppliers in nearly every phase of automotive design and production. Joseph Rajakaruna has experience with Honda through a University partnership as well as working with Ford supplier Visteon Automotive. Frederic Marangone spent some time with Peugeot and Opel. Automotive technician Aubre Decker brings 16 years of hands-on automotive technical experience. Machinist Ben Conrad who had experience working on drag racers, started as a welder with ZAP and now does the primary machine and fabrication. It doesn’t stop there with the diverse experience. The youngest team member, Prashanth Radhakrishnan, has spent time working on the Google Lunar X PRIZE involved in, literally, rocket science. And to prove that it takes all kinds of experiences to build cars, one team member, Brandon Kincaid, has prior experience working on roller coaster cars at Sandusky Ohio’s Cedar Point Amusement park, not to mention being involved in every Alias build to date. Throw in with that Starr’s experience in the design and creation of thousands of electric cars, trucks, conversions, bicycles, scooters, mopeds, motorcycles, and ATVs, and you have an automotive design and engineering team that relishes the challenge of 100+ MPGe cars. The team also has a distinct international flavor. Joseph Rajakaruna was born in Sri Lanka, Frederic Marangone in France, and Prasanth Radhakrishnan in India. Gary Starr is a native to the Bay Area of California; Charles Turney and Brandon Kincaid come from Toledo, Ohio; and Dave Aultman from Michigan bring more than 30 years experience in the auto industry. And a big thanks to Mike and Dave from Speedway Tire & Auto of Toledo. Oh yeah, and thanks to Alex Campbell for his crazy 19 years of trying to educate the world about how electric cars can become a commercial reality. We are proud of the talent gathered at ZAP, but let us not forget all the others who have made this possible, every customer, stakeholder, employee, partner, contractor, supplier, dealer, as well as their friends and family members, for their commitment to transportation alternatives. In particular, thanks to ZAP CEO Steve Schneider and Chairwoman Priscilla Lu for all their support, which has been so very important to the Alias. Thank you to the other teams. It was an exciting atmosphere in the team garage during Shakedown when teams found a spirit of collaboration. The challenge of 100+ MPGe is bigger than us all, and we found this particularly with our garage neighbor Team Wikispeed. Though in the end their beautiful dream of a 100+ MPGe race car wasn’t ready for the Shakedown, their teamwork and determination earned the respect and admiration of everyone in the garage as well as a standing ovation. We helped where we could, but when we needed help they also found the time to reach out to us. Such was the positive energy in that garage. It was truly an awesome, inspiring and rewarding experience. This is the energy we need to harness. And a big thank you in advance to the most important member of the ZAP Team: You. It is you reading this now whom we want to reach out to and who ultimately has the power make the Alias a reality by showing your support and commitment to the project. In the end, true success will be gauged by the satisfaction of our customers, and we invite you join the ZAP Team. Join our email list, follow us on Facebook, Twitter, and YouTube, keep commenting and sending in your feedback, and letting us know what you ‘Like’ and finally, reserve your ZAP Alias today – nothing can help the team more, and by doing so you can help ensure the bright future of electric transportation. Thank you.